Ground cover replaces half of the lawn in this garden, eliminating the need to mow on the hillside. Let's just be honest for a second. Turf lawns are resource hogs. For one thing, they require copious amounts of water—on average, and depending on the grass species, an established lawn needs the equivalent of 1 inch of water per week. And then there is the application of chemicals such as fertilizer and pesticides, and attention spent in regular mowing and maintenance, including aerating and dethatching. All this makes grass lawns rough on the environment, hard on your bank account, and a drain on your limited free time. We won't fault you for keeping your grass lawn—after all, it looks nice. But trimming down its size, or eliminating it altogether, can be beneficial to the environment while saving you time, money, and energy. Here are some alternatives. Ground cover plants are those that quickly spread horizontally across the ground without growing tall, so you don't have to mow them. Plants in this category are low-maintenance and they smother weeds. Choose a ground cover that performs best in your climate and environmental conditions—sun or shade. 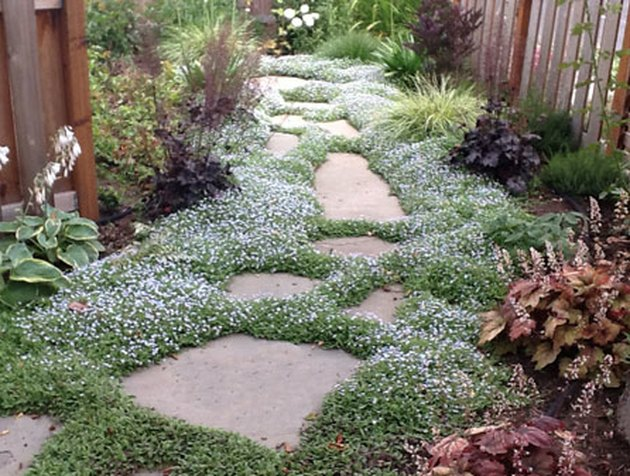 Some ground covers need to be held in check or they'll overrun the garden. Hot and dry, with sandy soil: The best ground covers for desert landscaping include succulents like Caucasian stonecrop, sedums, woolly speedwell, and trailing lantana or stonecrop succulents. Although young plants require watering, they need very little moisture once established, and none in fall and winter. Hot and humid, with sandy soil: Perennial peanut, powderpuff mimosa, and Asiatic jasmine thrive in these subtropical conditions. Bright and sunny, with four seasons: Even though it's hot in the summer, you also need a ground cover that's hardy enough to withstand winter. Among your choices are rock cotoneaster, Japanese star jasmine, creeping jenny, Japanese sweet flag, and creeping herbs such as thyme and oregano. Lilyturf, also known as monkeygrass, grows well in temperate climates, but beware of its close cousin, creeping lilyturf, which can grow aggressively. Shade or partial shade, with four seasons: English ivy is an especially tough plant, but it's considered an invasive weed in some locales. Vinca has pretty blueish violet or white blooms. Other options include pachysandra and lily-of-the-valley, both of which like plenty of moisture; and various varieties of hosta, which need some sun to look their best. Moss grows well in poor soil, but it must have moisture; however, it only needs a few minutes of watering daily, which is far less than grass. Once considered a sign of a well-tended lawn, clover somehow became a weed to be eradicated by lawn aficionados once broadleaf herbicides came into existence. Ah, how the tides turn … now clover is viewed as the perfect grass alternative because it grows fast, suppresses weeds, and stays green year-round. It's also beneficial to the soil because it enriches the dirt with nitrogen and aerates it with a deep root system. Although Dutch white clover is the most common variety used for lawn plantings, you can also explore crimson clover, red clover (which is actually violet), strawberry clover (a pretty pink), and yellow clover. You can plant clover almost anywhere, as some varieties prefer dry soil while others do well in water-logged conditions. It grows well in sun and more slowly in shade. Young plants need frequent watering, but once it's established, you can simply forget about clover. Ornamental grasses add texture to a yard, growing in tall, dense tufts that blow gracefully in the breeze and are meant to be admired rather than mowed. They like sun, are pest-resistant, and they require little water or maintenance and no fertilizing. Select a variety appropriate for your climate; it's always best to go with native grasses, which are already adapted and will therefore require the least amount of maintenance. Cool-season grasses: For northern areas with cooler temperatures, choose fescues, blue oat grass, autumn moor grass, and tufted hair grass. Warm-season grasses: These thrive in hot, southern regions, and include hardy pampas grass, deer grass, switch grass, northern sea oats_,_ prairie cord, Japanese silver grass, and perennial fountain grass. Some ornamental grasses are evergreen, and should not be trimmed back drastically, but the deciduous grasses that turn brown in the winter can be trimmed to a few inches tall to let new growth take center stage. 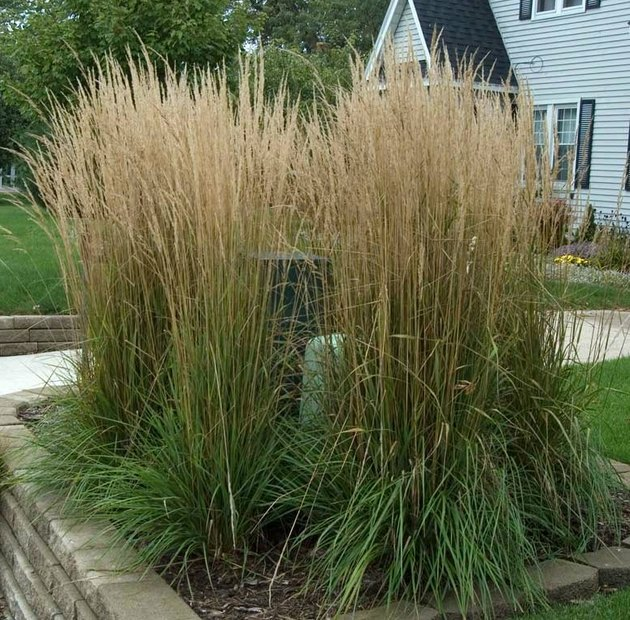 Feather reed grass camouflages unattractive garden fixtures and replaces a large section of lawn. Plant beds beautify a yard with color and texture, and you probably already have some. Consider enlarging them or adding more. Beds add visual interest when they contain taller plants, which can stand on their own or serve as a backdrop to short plants. Shrubs, especially, fill up space once they are big. Consider combining them with other lawn alternatives—you might situate large, dense shrubs in an expanse of mulch as a sculptural statement, for example. A wide expanse of delicate wildflowers bobbing gracefully in the breeze is a lovely, peaceful sight. You can plant a perennial meadow that comes back on its own every year, or sow seed mixes annually—either in mid-spring or in the fall. Perennials do well in poor dirt, but annuals need a rich soil. Both types grow best in sunny conditions. 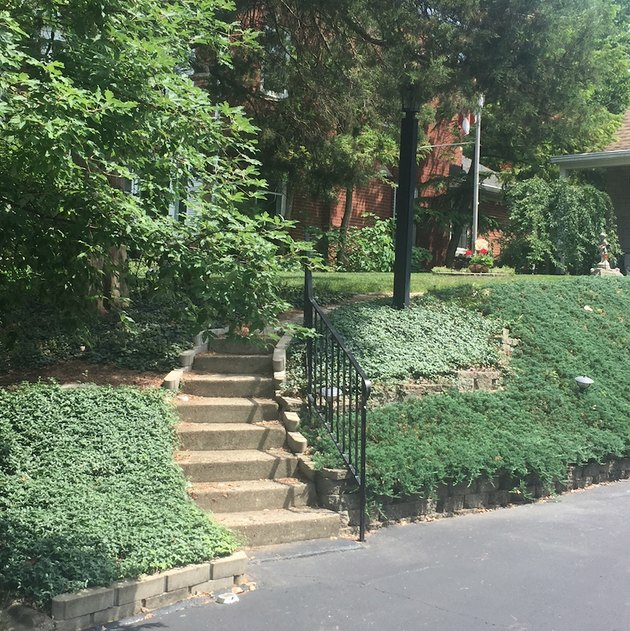 Natural meadow gardens may strike some neighbors as mere weedy lots, so it is a good idea to consult others in the neighborhood to gauge their reaction to this kind of native-species planting. And it is possible that your community or building association has some restrictions on natural meadow gardens, so check before planting. Reduce the amount of grass by adding such features as a koi pond, a patio, a deck, a fire pit, a gazebo, pathways, or even an outdoor kitchen. Pathways may be made of diverse materials, ranging from pavers or slate stepping stones to mulch or gravel. credit: Precision Landscape Services, Inc.
A pathway surrounded by ground cover eliminates the need for grass in this section of yard. Rock gardens are often the setting for specialty plantings, especially alpine or succulent species, but they can also stand alone as ornamental expanses that replace turf grass. You have a wide range of stones to choose from, including river rocks, pebbles, crushed or decomposed granite, and gravel. This gives you many colors and textures to play with. The advantages of a rock garden include no watering and practically no maintenance, as rocks inhibit weed growth. Rock gardens also don't attract insects. Covering ground areas with loose mulch allows you to experiment with color and texture, as well as eliminate grass. 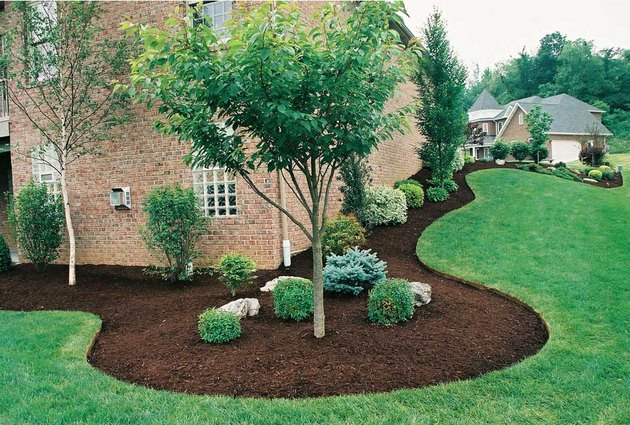 Mulch can be produced from a variety of materials, including wood chips, shredded bark, pine needles, sawdust, and straw mulch, each of which offers a different aesthetic look in the landscape. You can use mulch to retain moisture, control weeds, and protect root systems while covering gracefully shaped expanses of ground. Or use it to create paths between flower beads or rock garden features. Another non-organic option is rubber mulch, which is made from recycled, shredded tires. Frequently used in playgrounds—a questionable choice—it's certainly not a good lawn alternative. Studies find that the chemicals that leach from rubber are toxic, generating precancerous lesions and causing reproductive difficulties, and having the ability to kill off whole communities of algae, fish, snails, and zooplankton. While the synthetic turf of the past looked incredibly fake, you'll be amazed at how lifelike the modern product has become, with variations in blade color, dry-looking blades mingled with green, and even "grass" that appears to have thatch—the matted layer of dead and living grass blades, roots, and leaves that lies between a real lawn and the top of the soil. No watering, no mowing, no fertilizing, no weed control. And, yes, you can still get Technicolor green artificial turf if that's what you want. Synthetic turf is very easy to care for—cleanup is a matter of blowing or vacuuming debris off the surface. And artificial turf is immune to damage caused by pet urine, which can destroy a grass lawn. 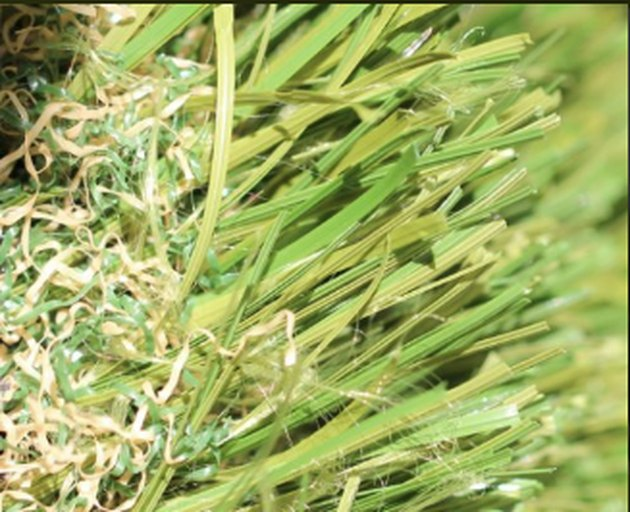 This lifelike artificial turf combines variations in blade color and thatch details to better mimic living grass.